CPDM militants are reportedly joining a campaign calling on President Paul Biya to go on retirement, when his current mandate ends in 2018. The campaign is dubbed “The People’s Call For President Biya’s Retirement”. The launcher of the campaign is the 1st Assistant National Secretary for Communication of the SDF, Abel Elimbi Lobe. A Councillor at the Douala V Urban Council, Elimbi Lobe wants to help persuade 84-year-old Cameroon’s Head of State to take his long overdue retirement when his current mandate ends. “I am acting in this operation as an individual, a politician, an elected representative of the people, a concerned Cameroonian citizen,” Elimbi Lobe told The Post by phone in Douala on February 22, 2016. Lobe launched the campaign to counter the trident calls from CPDM militants across the country for Biya to, once more, be the party’s candidate at the next Presidential election in 2018. Biya is also the National President of the CPDM party. According to Lobe, he is not acting in the campaign as an SDF militant, but as a concerned citizen. He said the SDF, as a political party, can only rightfully intervene in the issue of early election but it would not be appropriate for the party to get involved in the debate as to whether or not Biya should be the CPDM candidate at the 2018 Presidential election. In order to speed up the campaign and convince at least 5,000 Cameroonians of voting age to append their names and signatures on the letter destined for Biya, a number of people in Douala has joined the organising committee of the campaign, while others have volunteered to collect the signatures. Signing online has also been made possible. Elimbi Lobe says they plan to organise a public rally in Douala and hand the letter to the Governor of the Littoral Region, Samuel Dieudonné Ivaha Diboua, for onward transmission to Biya. Elimbi Lobe disclosed to The Post that, within a few days of launching the campaign, more and more Cameroonians are signing up. He said by February 22, 2016, more than 400 people had already signed the letter online. Lobe said some CPDM militants have also signed the letter. 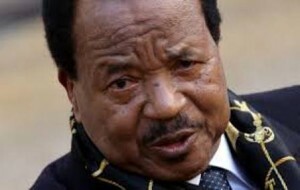 He said the fact that an increasing number of CPDM militants are signing the letter is a glaring indication that many grassroots militants of the party do not agree with the elite who still want Biya to remain in the seat of power. According to Lobe, there are two main objectives of the campaign; to disprove the false impression that CPDM elite are trying to sell to the international community – that there is no unanimity in the country for the calls to Biya to run at the 2018 Presidential election. “They are just trying to push this old man to death by hanging on to power for their selfish interest,” Lobe said. He insisted that anybody who wants to see an old man of over 80 years hang on to power only wants to see the old man dead. “A man of Biya’s age should be on retirement at home, resting and being taken care of by the family,” said the SDF NEC member. The second objective is to put an end to what is becoming a culture in Cameroon politics whereby people stay in power for too long. Lobe recalled that Cameroon’s first President, Ahmadou Ahidjo, stayed in power for over 20 years. Elimbi says Biya has been in power for over 30 years, and from all indications, wants to manipulate the Constitution to position his successor. He argues that if Cameroonians allow Biya to hand-over power to a handpicked successor, then the country is doomed forever. Elimbi Lobe says Cameroonians must do all to see that President Biya takes his long overdue retirement, and not be a candidate at the next presidential election. Please help direct us the link to sign online. Is Biya really the problem?I don’t think so.